Ten days in to 2016…are you back into the regular routine yet? I’m still struggling. The kids don’t want to get up early for school, activities are all back in full swing and things have been insane! A bright spot has been the fact that getting back into our regular schedule has included recommitting to healthy eating AND hitting the gym on a regular basis. So getting back into routine has been a challenge, but it’s been awesome. 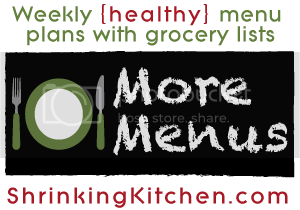 This week’s menu plan is fun and flavorful and is definitely going to make the continuing adjustment out of the holidays much easier! These recipes are some of my favorites…a super easy chicken pasta dish that comes together in 20 minutes. Taco dip that is perfect for a casual weeknight dinner. Even some sweet and savory meatballs that are packed full of flavor and I’m sure you’ll love! If this week’s menu not your bag? No worries…we’ve got hundreds of menu plans in our archives. Monday: Chicken Penne Provencal with a green salad. Tuesday: Curried Quinoa Bake with green salad. Wednesday: Shrimp Zoy over whole wheat pasta with steamed green beans. Thursday: Skinny Taco Dip with baked tortilla chips and fresh veggie dippers. Saturday: Saucy Asian Meatballs with brown rice and steamed broccoli. Breakfast: Whole Wheat Chocolate Cherry Muffins. jicama, carrots, celery and cucumber – or whatever fresh veggies you’d like to dip!